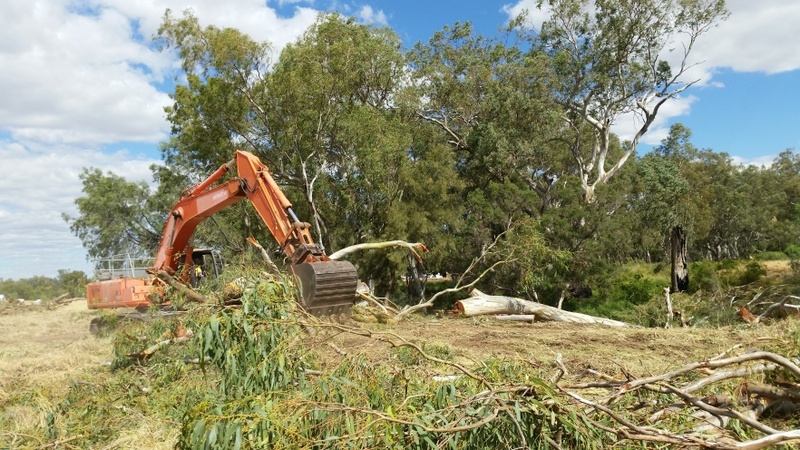 Dusty, dirty, long days scrambling over timber, debris and conducting searches through long grass, along tree branches, hollows, logs and bushes for native critters to get them out of harms way, before and after machines have felled timber or cleared land for some construction purpose. Not everyone’s cup of tea, however our BOOBOOK Fauna Spotters love it. You never know what you may find….perhaps a range extension for a particular species or a new species of animal altogether, like different land snails we’ve found before now. 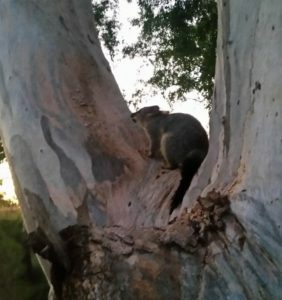 It is also just a great feeling knowing you have saved a native animal from the demise of heavy machinery passing over it. It is even more exciting when the dozer or excavator drivers get excited and want to know or learn about what is being caught. In turn this helps increase public awareness, as well as providing a handy extra set of eyes when out on a project. Fauna Spotting is not a job where you should expect to sit around in your car all day. To do the task properly you need to be out in the vegetation checking and rechecking. It is physically demanding and can often be exhausting during the hot summer months if working on a site for an extended period. Depending on the vegetation type and habitat contained within it, some days we might not find many animals and other days our collecting bags are full of wildlife to be relocated. They’re relocated in nearby vegetation which won’t be disturbed as part of the wider project. Recently I had to don on the steel cap boots and fluoro shirts to go fauna spotting for a couple of weeks. While this is something I’m quite capable of doing (I do have an ecological background and have had a lot of experience with animals over the years); I rarely get the opportunity, as I’m generally too immersed in the management and development side of our businesses and find it very difficult to get away. On this particular occasion nobody else was available, so away I went. 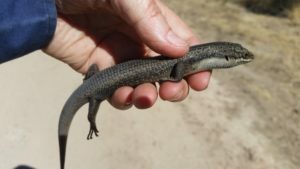 During the latest stint I caught and released a couple of possums, numerous skinks, geckos, blind snakes, a microbat and watched an Eastern Brown Snake move across the site safely out of harm’s way. No need to catch them if you don’t need too. I was very annoyed when a kookaburra beat me to a Tree Skink, however sometimes there just isn’t anything you can do about it as it’s natures way. Fauna Spotting Catching comprises around 10% to 15% off our ecological business. The rest involves more scientific work like flora and fauna surveys, ecological assessments, weed surveys and vegetation assessments. We are often the people who assess the ecological values of a site during the planning stages well before any construction actually begins. Fauna Spotters need to be good communicators. Fauna Spotting is generally 80% communication, organisation, searching, safe management practices and reporting and only around 20% (or less) actually handling animals. 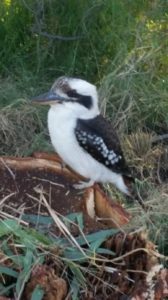 Interestingly, Fauna Spotting Catching wasn’t even a recognised career in Queensland until around the early 2000’s, when government started issuing construction and development approvals that included a requirement for a fauna spotter to be on site during clearing. This generally involves a preclearance inspection just before the excavations equipment begins work and working alongside the machinery (safely) during the clearing, checking fallen timber for hidden wildlife during and after felling. Fauna Spotting as a profession is in its infancy, with people only needing to apply for a Rehabilitation Permit, which is generally quite easy to obtain. There is currently no ‘recognised’ industry standard and as such people can start up a Fauna Spotting Catching business on a whim with little to no experience, training or ecological background. Don’t get me wrong, there are some great Fauna Spotter Catchers out there; however, unfortunately there are those also who are at the other end of the spectrum which, in turn brings the whole industry and authenticity of the skill, and the reason for having fauna spotters, down. Fauna Spotting is currently recognised as a low skill, low paid and very competitive profession as a result of easy entry– a two day course can have you ticked off by most contractors who employ fauna spotters either directly or as sub-contractors in their own right. When cost is a major component and a key project performance indicator, you can’t blame the construction industry for sourcing the cheapest option available. It is only those that are socially or environmentally conscious who are generally willing to pay for higher skilled, well-equipped and safer Fauna Spotter Catchers. There is finally some movement to strengthen the skill level and expertise required to be recognised as a Fauna Spotter Catcher. This is a great move for the industry and something I would love to be involved in, after at least 15 years in this space. I believe this will be a great thing and ensure better business, safety and environmental outcomes as I’ve heard of many situations in the past where some people have been sent out as fauna spotters which little to no experience, just to tick a box. One story tells of a company sending their resident cook out to be a fauna spotter for a day because they couldn’t find anyone else in the hype of a boom construction period. Not only is this very unfortunate for the animals – little experience means people don’t know what animals to expect and where to look, potentially resulting in many probably getting missed – it also poses a great safety risk for those involved. Here at BOOBOOK we pride ourselves on being ecologists first. All our safety management systems are in place. Not only does our staff have relevant tertiary degrees, they have or are backed by people who have years of experience working in the field with a fantastic knowledge of both native animals and plants found here. Our Senior and Principal Ecologists can tell you exactly what species it is by sight and sound (e.g. a bird or frog call). They have also trained many of our past and current Fauna Spotters. Our staff members are also highly respected within the ecological industry across government, the private sector and in the community.